Well it's not the full rainbow, but it's pretty darn close. Yellow, orange, green and purple with my plate and cutlery giving a touch of blue. Pasta is such a great mid-week meal. It's quick, filling and you can make it really special with a fresh sauce, pesto or roast vegetables. When I'm making pasta with roast vegetables, I usually toss the pasta in some pesto, sometimes I make it, but I always have a jar of dairy free pesto on standby. I decided to skip the pesto this time so the flavours could sing. I went all seasonal and roasted red onions, courgette (zucchini), aubergine (eggplant), chestnut mushrooms and butternut squash. With such sensational and autumnal flavours, it would have been a crime to cover it with a sauce, so I just tossed the pasta and veg in a drizzle of rapeseed oil (which has a nutty flavour and is healthier than olive oil) and some fresh herbs. A good grinding of black pepper and it was good to go. 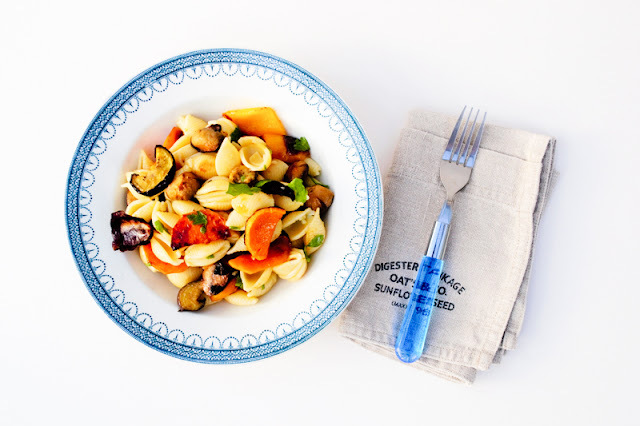 Seasonal Autumnal vegetables roasted and stirred through pasta with a drizzle of rapeseed oil and fresh herbs. A perfect mid-week family meal. 1. Heat oven to 220c/200c fan/gas mark 7 and pop a roasting tray in the oven to heat.2. In a bowl, toss the vegetables with 2 tablespoons of rapeseed oil until coated, then place in the roasting tray in an even layer. Roast for 25-30 minutes, turning once or twice until they are tender and starting to char at the edges.3. 10- 15 minutes before the end of cooking time, boil the pasta until al dente.4. Chop or tear the herbs and mix through the drained pasta with a glug of oil, add the roast vegetables, season with black pepper and mix through so the pasta is well combined with the vegetables and herbs,5. Enjoy!Notes: to serve this as a pasta salad, rinse the pasta under cold water until it is cool before adding the other ingredients. This will remove the starch, stop the cooking process and leave you with shiny, firm pasta. 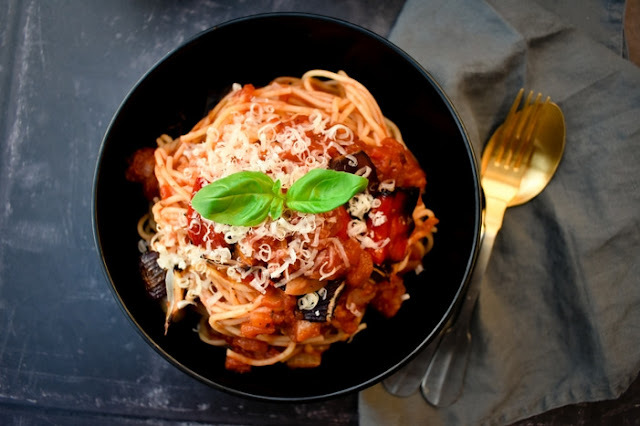 If you like this pasta, why not try my Tomato and Roasted Red Pepper Pasta Sauce for spaghetti? I'm always in love with your recipes, Jac! You've prepped autumn in a plate here! Ohhh this looks delicious! And I just LOVE your fork and plate. I will add this to my "recipes to try" Pinterest board now. Thank you for sharing. The plate was part of a haul from a junkyard. I'm rather fond of it. Oh yes, they are always good, it really does improve the flavour. Lovely! Eating a rainbow always makes you feel good. This is a gorgeous pasta! so naturally healthy and very simple which is ideal for these rush-about days! Oooh. This looks absolutely delicious, super easy AND full of healthy veggies - my kind of recipe! Am bookmarking.